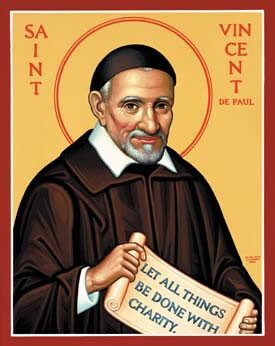 St. Vincent de Paul was born on April 24, 1581 in the Kingdom of France. At the young age of 15, his father sent him to the seminary, where St. Vincent hoped to establish a successful career as a priest, so that he could retire early and comfortably. However, God had other plans in mind for St. Vincent. Although the seminary he attended was not very pious or spiritually contemplative, he continued his studies and was ordained a priest on September 23, 1600, at the age of 19. After his ordination, he continued to study, as he had a natural gift for reading and writing, but he felt little connection to his faith; rather, he desired a life full of wealth and fame. In 1605, while returning home from a journey, St. Vincent was taken captive by Barbary pirates, who took him to Tunis, Africa, and auctioned him off as a slave. He was a slave for two years, and had many different owners, but he eventually gained his freedom by converting his last slave master to Christianity. He and his owner escaped to France together in 1607. During St. Vincent's time in slavery he strengthened his own faith significantly and prayed that if he were to be freed, he would dedicate his life to the poor. When he returned to Europe, he devoted his time and energy to serving as a priest and spiritual advisor. St. Vincent also made many very wealthy friends, who he then persuaded to donate funds for food and hospitals for the poor community. He also used their money and connections to liberate 1200 slaves from North Africa. Through his charity work, St. Vincent became acquainted with St. Louise de Marillac, and together they founded the Daughters of Charity, a society of apostolic life for women within the Catholic Church. The Society of Saint Vincent de Paul was also created, and is a charitable organization present in 132 countries. This society is dedicated to the service of the poor, and was inspired by St. Vincent. St. Vincent de Paul died in Paris on September 27, 1660, and when his body was exhumed in 1712, 53 years after his death, he was found to be incorrupt. However, due to an underground flood, St. Vincent’s body was found to have later decayed naturally, with the exception of his heart and bones. St. Vincent de Paul was canonized on June 16, 1737 by Pope Clement XII, and his Feast Day is on September 27. He is the patron saint of charities, hospitals and horses, among many other things.